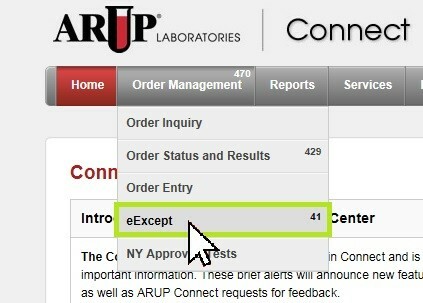 ARUP’s web application, eExcept, accessed through Connect, offers clients a secure online portal for timely exception handling information and two-way communication to efficiently monitor and manage specimens after they have been sent to ARUP. Key benefits include: assurances of resolution and follow-up; dialogue with ARUP laboratorians; and visual and email notifications of specimen exceptions (excepts). View “Open” cases, and “Completed” cases by selecting the appropriate tabs. 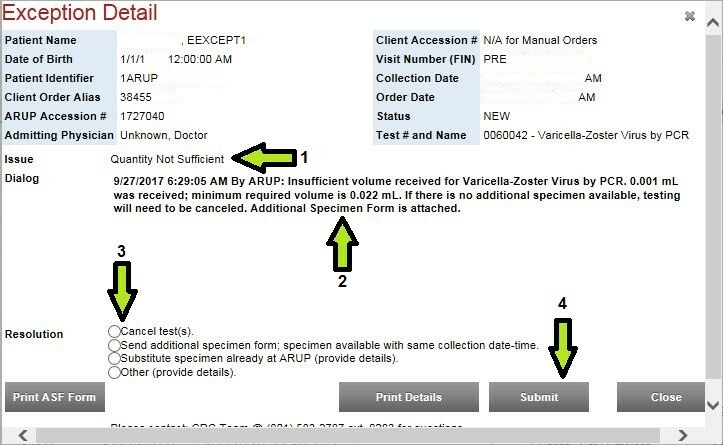 View “Exception Detail” information by clicking an Accession number of an open or completed case. How do I resolve an Except? In Connect, click on eExcept under the Order Management tab. Click on the patient accession* you are looking to manage. *Note: Excepts for the past 3 months will be listed. Read through the Exception Details and choose a Resolution. Issue—a summary of the Except. Dialog—comments made by ARUP’s Exception Handling and responses provided by the client. Resolution—possible actions* to resolve the Except. Other is the only available option when an Except needs clarification. Comments are not required unless Other is selected. Click Submit to send resolution to ARUP Exception Handling. Q: What is the source for information displaying in web eExcept? A: The Exception Handling department and their desktop application are the sources of information. The Connect application is the information delivery mechanism for clients. Q: Who should be contacted regarding technical issues with web eExcept? A: Yes. Downtimes to eExcept will occur when Informatics schedules releases to the application. All downtimes or planned interruptions are known in advance and communicated to clients on the Connect Login homepage within 24-48 hours of downtime. Typically downtimes for releases are for 2-3 hours, usually in the evening after close of business. Q: Can clients turn off email notifications for eExcept? A: It is not recommended to turn off email notifications, unless a large volume of reports is frequently expected. Email and visual notifications are very useful to help clients manage their workload and to benefit from the timeliness of eExcept.